During the Sioux Indian Uprising of 1862, Milford Township, in Brown County, was attacked. On August 18, 1862, 52 settlers that resided in Milford Township were killed. This township had the highest loss of life during the entire uprising. The largest group killed was a recruiting party on their way to the Civil War battlefield. They were ambushed about 5 miles west of New Ulm while they were going over a bridge. The survivors of this massacre escaped to New Ulm. 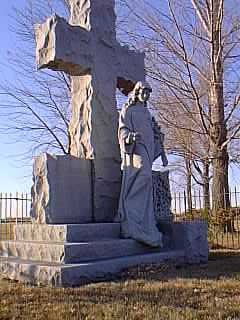 There is a monument to honor the memory of the 52 settlers that were killed in Milford Township. Their names were: John Martin Fink, Monika Fink, Max Fink, Carl Merkle, Florian Hartmann, John Baptist Zettel, Barbara Zettel, Elizabeth Zettel, Stephan Zettel, Anton Zettel, Johanna Zettel, Max Zeller, Ludrella Zeller, John Zeller, Monica Zeller, Cecilla Zeller, Conrad Zeller, Martin Zeller, Anton Mossmer, Mary Ann Mossmer, Joseph Mossmer, Martin Henle, Anton Henle, Mary Henle, Frank Massopust, Mary Ann Massopust, Mary Massopust, Julia Massopust, Frank Massopust, John Rohner, Barbara Rohner and one child, Sebastian May, Barbara May, Henry May, Bertha May, Henry Heyers, Dorothea Heyers, Joachim Heyers, Mrs. Jon Btocher, Benedict Drexler, Frank Drexler, Christ Haag, Adolph Schilling, John Kech, Mrs. Brigitta Pelzl, Fred Gluth, Joseph Emmerich, George Roosser, Barbara Roosser, Theresia Higgensdoerfer. 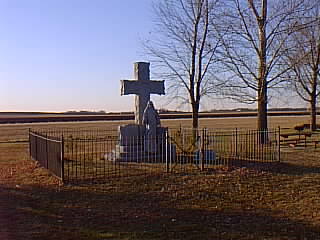 The monument is located at the site of the massacre two and a half miles northeast of Essig and 8 miles west of New Ulm on County Road 29 in Brown County.